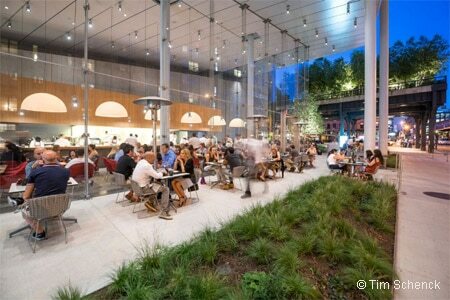 Danny Meyer's restaurant at the Whitney Museum of American Art in the Meatpacking District is a work of culinary art. : Danny Meyer's Untitled, located in the Whitney Museum of American Art in the Meatpacking District, might rival the chief reason most people would come to the museum. Instead of looking at art hanging on the walls, taste the artistic renderings on the plate from chef Michael Anthony. 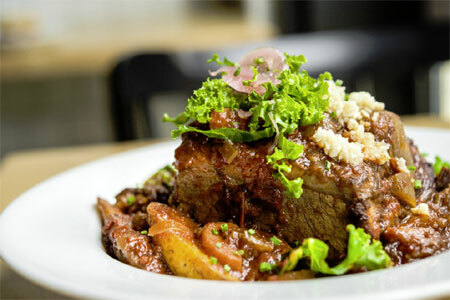 The menu offers a study in haute dishes and vegetable-focused offerings. With art all around the space --- from Renzo Piano's design of the building to the Eero Saarinen chairs you're sitting in --- sip a glass of wine from the extensive list and feast on fried chicken that comes with a crust so crispy it tends to just crack off, revealing moist and satisfying meat underneath. Corn and bacon flatbread arrives so colorful (and pleasing to the palate) you'd think Jackson Pollock had a hand in its creation. Do yourself a favor and save room for the peanut butter blueberry crunch cake for a sweet finish.